and close to 10 Km to the city of Faro. Our location allows you to enjoy a long and narrow, apparently endless sandy beach (with over 5 km of coast within a small peninsula) with its deep blue sea and calm waters. 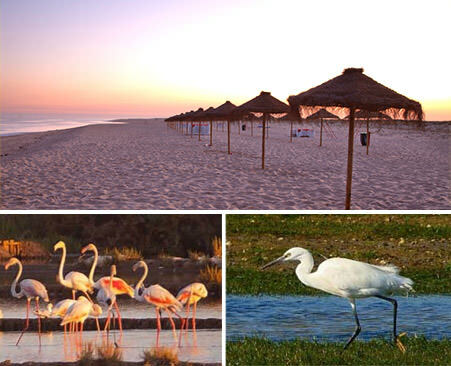 On the other side of Faro Beach you can delight your eyes into the small surrounding river, ("Ria Formosa") which is characterized by its sand banks and smaller spits of land with its own particular ecosystem, where you can find rare species of northern migratory birds, as you look over towards the mainland, Faro's Airport and the small mountains contiguous to this area.